Mother’s Day is just around the corner, and you might still be looking for a way to treat the most important woman in your life. Here are some ideas to celebrate your mom this year! Chateau Chantal is hosting a multi-course wine pairing dinner on Saturday, May 12, with a delicious menu prepared by Sugar 2 Salt. This five course dinner includes wine pairings, tax and tip for $85. Brengman Brothers Winery is hosting a Pre-Mother’s Day Flowers and Wine Workshop on Saturday, May 12. 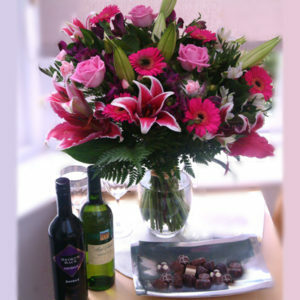 Create a masterpiece flower arrangement for your mom while enjoying wine and small plate foods. Workshops are offered at 11:00, 1:00 and 3:00 and cost $45 per person. There are numerous Mother’s Day brunch options throughout northern Michigan! Firefly, West Bay Beach Resort, Maddy’s Tavern, McGee’s, Boathouse, Mulligan’s, Crystal Mountain, and Black Star Farms all offer a variety of Mother’s Day brunches. Grand Traverse Resort also offers a Mother’s Day brunch at Aerie Restaurant, spa deals all weekend, and complimentary golf for women! You could also take Mom to a matinee of Young Frankenstein at the Old Town Playhouse. The show runs from May 4 through May 26 with a 2pm performance on Mother’s Day. Moms can also enjoy a free slice of pie at Grand Traverse Pie Company on Mother’s Day, as well as enjoy the facility free of charge at the Grand Traverse Bay YMCA all weekend. Norte & Timber Ridge are also hosting “Take a Mom Mountain Biking Day” for the whole family! As always, we’d love to help you find your perfect home in northern Michigan. Click here to search for properties for sale in the Traverse City and surrounding areas, or contact us at dekrealty@gmail.com.